In pulsatile tinnitus, people hear something resembling their heartbeat in their ear. Pulsatile tinnitus is usually due to a small blood vessel that is coupled by fluid to your ear drum. It is usually nothing serious and also untreatable. Rarely pulsatile tinnitus can be caused by more serious problems -- aneurysms, increased pressure in the head (hydrocephalus), and hardening of the arteries. A vascular tumor such as a "glomus" may fill the middle ear, or a vein similar to a varicose vein may make enough noise to be heard. Inner ear disorders that increase hearing sensitivity (such as SCD) can cause pulsatile tinnitus. As this condition can be corrected surgically, it is one of the few "fixable" causes of pulsatile tinnitus. In the few patients we have encountered, the sound was not a "swishing" sound. There are some very large blood vessels -- the carotid artery and the jugular vein -- that are very close to the inner ear (see diagram above). 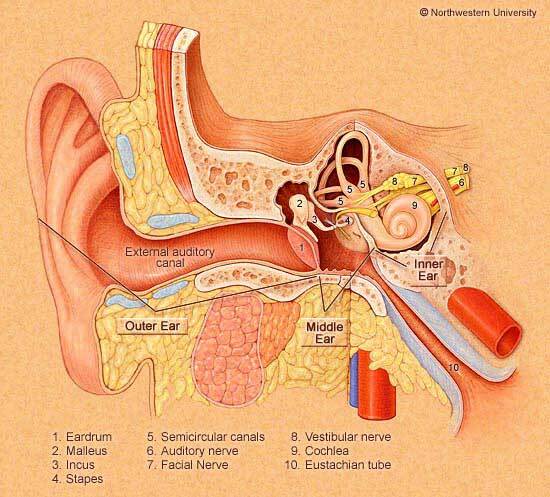 Noise in those blood vessels can be conducted into the inner ear. Accordingly, other possibilities for vascular tinnitus include dehiscence (missing bone) of the jugular bulb -- an area in the skull which contains the jugular vein, and an aberrantly located carotid artery. An enlarged jugular bulb on the involved side is common in persons with venous type pulsatile tinnitus. Anything that increases blood flow or turbulence such as hyperthyroidism, low blood viscosity (e.g. anemia), or tortuous blood vessels may cause pulsatile tinnitus. It is common for persons with pulsatile tinnitus to have some sort of procedure done in the Radiology department, looking for something that can be fixed. Usually these show nothing. Rarely they find something important. Even when "something is found", usually there is nothing to do other than say -- maybe this is causing your tinnitus. Persistent stapedial artery (isolated aberrant vessel in the inner ear, seen on CT). The ipsilateral foramen spinosum is absent in these patients. Other entities than the ones listed above that can sometimes be seen on radiological testing and that can cause pulsatile tinnitus, include AVM's, aneurysms, carotid artery dissection, fibromuscular dysplasia, venous hums from the jugular vein (found in half the normal population), vascular tumors such as glomus, ossifying hemangiomas of the facial nerve, osseous dysplasias such as otosclerosis and Paget's, and elevated intracranial pressure. Practically, MRI/MRA or CT is often suggested in younger patients with unilateral pulsatile tinnitus. In older patients, pulsatile tinnitus is often due to atherosclerotic disease and it is less important to get an MRI/MRA. A lumbar puncture may be considered if there is a possibility of benign intracranial hypertension. More invasive testing includes the "balloon occlusion test", where a balloon is blown up in the internal jugular vein to see if it eliminates tinnitus. These are very rarely done. If tinnitus goes away with compression of the Jugular vein in the neck, it is usually not going to help to get any kind of radiology procedure. On the other hand, if somebody else can hear tinnitus (with a stethoscope on the skull), that is a good reason to get a vascular procedure. In 2018, MRI/MRA is generally the best choice, as it has high resolution and has no radiation. The purpose of the MRI is to look for intracranial hypertension. In our opinion, a "Time resolved MRA", is usually the second step after an MRA is done and is abnormal. Selective catheter angiograms are unreasonably dangerous. CT angiograms, done with venous contrast, combine high radiation with low yield. This is a congenital anomaly in which the internal carotid can present as a middle ear mass. If the carotid fails to develop correctly during fetal life, the inferior tympanic artery enlarges to take it's place. It enters the skull through it's own foramen, courses through the medial part of the middle ear, and then rejoins the petrous ICA (Branstetter and Weissman, 2006). The ICA may not have a bony covering as it courses through the middle ear. A bruit from a narrowed IC may cause tinnitus. Some authors claim that branches of the AICA may abut the 8th nerve and cause tinnitus. We find this idea dubious. Tinnitus due to AV fistula. Dural Arteriovenous fistulae (DAVF) cause loud noises, synchronous with the pulse, that can often be heard by others with a stethoscope, or sometimes by simply putting one's ear next to the person's head. 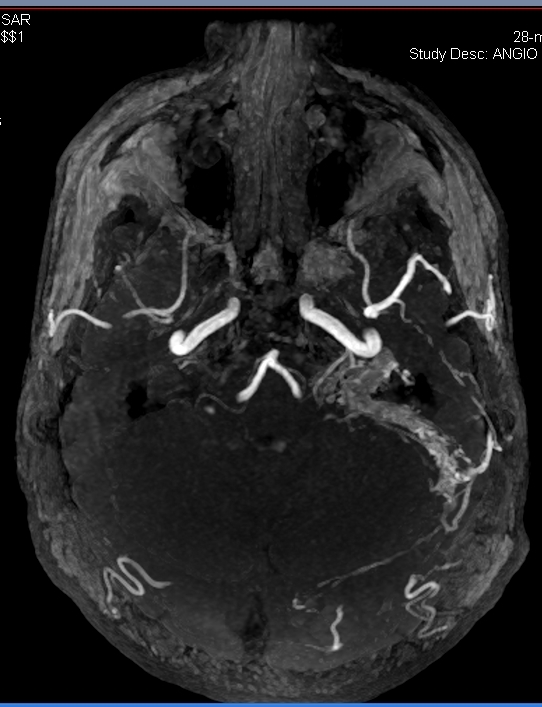 DAVF receive blood through meningeal arteries or meningeal branches of cerebral arteries and drain directly through a dural sinus or venous channel tributary of a venous sinus through dilated deep veins (Signorelli et al, 2014). DAVF are thought to be acquired and are associated with intracranial surgery, ear infection, tumor, hypercoagulability, puerperium, and trauma. (Adamczyk et al, 2012). DAVF are classified through several systems. The Cognard states that type I and II DAVFs drain directly into dural sinuses, the difference being antegrade flow in the type I, and retrograde flow in the type II. Types III and IV drain directly into the cortical veins, without dural venous drainage. Type V drains into perimedulary veins. The antegrade flow types are thought to be more benign, while retrograde is thought to be a more "aggressive" course with more likelihood of hemmorage. The risk of hemmorage increases with direct drainage into cortical veins (Signorelli et al, 2014). Diagnosis generally includes CT or MRI imaging. The type II have more severe findings, while the type I can even have normal imaging. According to De Keukeleire et al (2011), Type I DAVs are low risk and need be treated only if symptoms are intolerable. To be certain there is no DAVF at all, 6 vessel DSA is suggested by the interventional radiologists. Of course, this entails risk of stroke from the procedure itself. Signs of venous congestion are seen in about 80% of the "malignant" DAVF's, and only 8% of the type I DAVFs. (Signorelli et al, 2014). Surgery can be used when embolization fails, is not feasible or is incomplete. Surgery is sometimes preferred for fistulae draining into the superior sagittal or dominant transverse sinus when embolization might result in an undesirable sacrifice of the dural venous sinus. In the late 1970's and 1980's, surgery was the primary treatment. Radiosurgery is mainly reserved for cases that persist after embolization, but some authors use the opposite order -- radiosurgery first, followed by a clean up embolization (e.g. Friedman et al, 2001). The reason for this order is that embolization might obscure the target for the radiosurgery if performed first. Radiosurgery by itself has a low success rate as the only treatment (Signorellli et al, 2014). It is also a poor choice for those with hemorrhage, because it is slow acting (1-3 years), and more hemorrhage might occur while waiting for the blood vessels to close. On the other hand, radiosurgery is likely a more durable long term treatment than embolization alone. Recurrence of fistulae may appear, possibly due to release of growth factors associated with local tissue hypoxia, following occlusion of the DAVF. Extra caution is needed when the fistula is in the posterior circulation (i.e. fed by the vertebral artery), as it is difficult to thread a catheter through these tiny arteries. It is easy to cause a "vertebral dissection", possibly accompanied by a stroke. It may seem silly to say this, but in our opinion, it is generally not worth taking on a significant risk of having a stroke to attempt to get rid of a noise in one's head with embolization. The US health care system pays interventional radiologists very well to do embolization, and of course, they have motivation to improve people's lives through their training. Nevertheless, the decision whether to go forward with a dangerous procedure should be made by the patient's treating physician, rather than by a radiologist. Decisions about life-threatening procedures should not be made by the radiologist who may be well trained to thread a catheter into a patient's head, but has no long term relationship with the patient, and also generally has had no clinical training in otolaryngology or neurology. We suggest getting a 2nd opinion from a non-radiologist expert before proceeding with embolization for tinnitus. To avoid conflicts of interest, ideally the expert should work for another medical institution. AV fistula associated with pulsatile tinnitus. Courtesy of Dr. Marcello Cherchi. 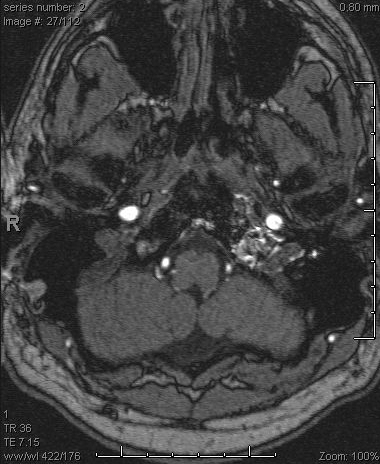 Dural AV fistula of the transverse sinus associated with pulsatile tinnitus. Courtesy of Dr. Dario Yacovino. This subject is discussed on a separate page. Pulsitile tinnitus can also be associated with benign intracranial hypertension (BIH), also known as pseudotumor cerebri. This is discussed here. Adamczyk, P., et al. (2012). "Recurrence of "cured" dural arteriovenous fistulas after Onyx embolization." Neurosurg Focus 32(5): E12. De Keukeleire, K., et al. (2011). "Transarterial embolization with ONYX for treatment of intracranial non-cavernous dural arteriovenous fistula with or without cortical venous reflux." J Neurointerv Surg 3(3): 224-228. Friedman, J. A., et al. (2001). "Results of combined stereotactic radiosurgery and transarterial embolization for dural arteriovenous fistulas of the transverse and sigmoid sinuses." J Neurosurg 94(6): 886-891. Puffer, R. C., et al. (2012). "Curative Onyx embolization of tentorial dural arteriovenous fistulas." Neurosurg Focus 32(5): E4. Signorelli, F., et al. (2015). "Diagnosis and management of dural arteriovenous fistulas: a 10 years single-center experience." Clin Neurol Neurosurg 128: 123-129.